Hello everyone! 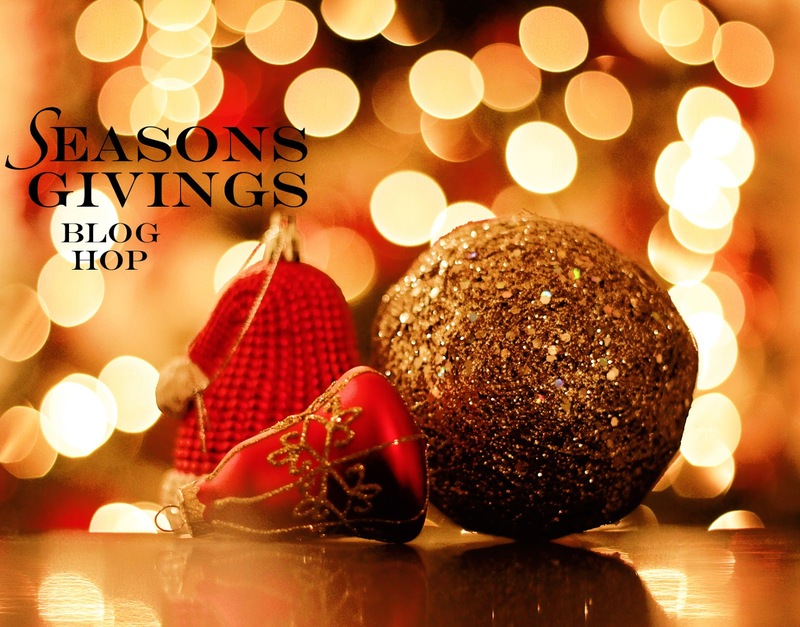 It's Jillian, and thank you for joining me on the Season's Givings blog hop! I am honored to be a part of it! Thank you for visiting my blog through out the year, being in high school AND college makes it a little hard to blog as much as I would like! Thanks for sticking with us this whole time, and I hope you've enjoyed all the blogs and amazing projects so far! Today I have an adorable card for you, which I am excited to share! Don't forget to stop by the A Jillian Vance Design blog for another card and a video from me! Remember, there will be a giveaway at the end of this post, so make sure to read it all and complete the Rafflecopter giveaway and leave a comment to be eligible! This new Mini 3D Bow Die Set is sooooo CUTE!!! Is is 30% smaller than our original and 20% smaller than our Buttons & Bows Die Set. The Mini Bow features a stitched accent. I used the Simply Said: Love Struck Stamp set to create the background of hearts and for the sentiment! For the base I used a Red A2 Card, then layered a Basic Rectangle Backdrop in Black and the Polka Dot Rectangle Backdrop die cut in White! Accented with our Scarlet Sequins and you have a quick and easy Valentine card! Please enter my drawing to win a $20 Store credit to my A Jillian Vance Design Store! Here is the complete Blog Hop List! Jillian Vance YOU ARE HERE!!! Just so adorable...Happy New Year. Oh, what a pretty card! Love the trio of bows! Beautiful card. Love those bows. Happy New Year!!! 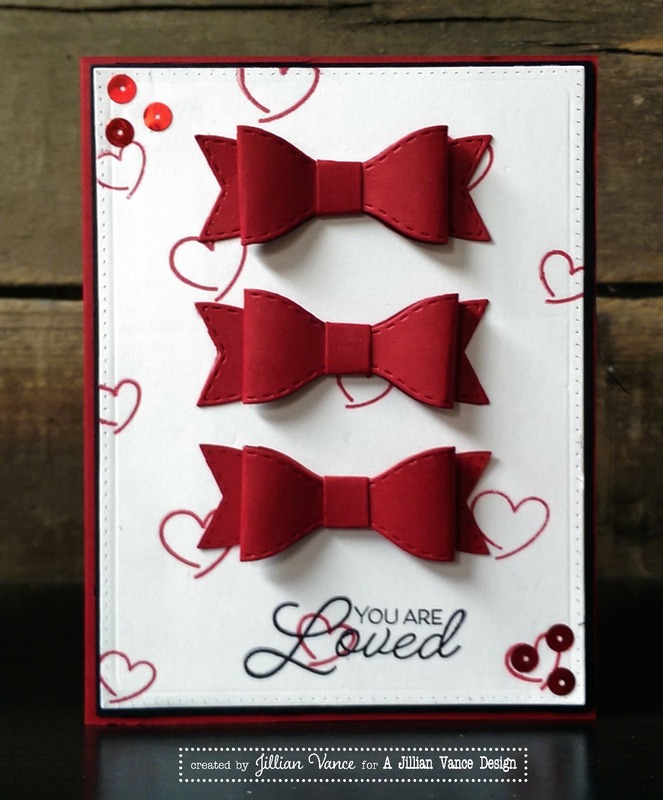 Love your card and those adorable bows are just divine!! Thank you for your inspiration and giveaway! That is the sweetest card!! Love your card, super sweet! Happy New Year! Happy New Year. Here's to a year full of crafting! So cute! Thanks for the chance to win! Happy New Year!! How cute. Saving this idea. Love your bows! So cute!!! Happy New Year! Lovely card with the bows and the heart background. I love your cute and simple card. The red really makes it pop! Hearts and bows are the perfect combo for your card! Thanks for a fantastic giveaway! Love the bows. Happy new year! Awesome hop. Wonderful little bows. Great card. Thank you for the chance to win. Lovely bow card,it's so sweet,cute and elegant!Love it! Fabulous card! I love the bows with the stitch accent. Happy New Year! What great products. Thanks for the chance to win! Use more of what I have! Love that bow tie project!!! Lovely card that can be used with so many different sentiments. Such an adorable design! Wishing you a Happy Happy 2016! Lovely and cute card:-) Happy 2016! That mini bow die looks awesome! Love your projects and the pictured Mini 3D bow set. Happy New Year! This card leaves me fit to be tied! With happiness that is! LOVE it! Happy new Year! I liked your Masculine card on facebook. Thanks for sharing. Happy New year, thanks for awesome blog hop! Your card is gorgeous! What a great idea to use those bows as focal points! Thanks for being part of this fun blog hop and for the great prize you are offering. Best wishes for a very blessed new year. I have a daughter your age, and I think she's busy (she's also doing an early college program while still in high school), but I can't imagine your schedule! Well, you're a sweetie to be in here twice!! LOVE this adorable chic card! Thanks for the chance to win some goodies from your store! Such a fun card, you are amazing! Thanks for offering the prize and all the best in 2016! I like the addition of the stitching on the bow die! Like this card. Followed you on Pinterest. Happy 2016! Love you sweet card. Thanks for sharing. Love your card!! Thanks for this wonderful opportunity. Have a happy new year! WOW Jillian, you are quite generous in offering several different ways to win a gift card to your goodies!! THANK YOU! Love your work and your designs. You are an AMAZING person. Thank you for participating in the blog hop and allowing everyone to see your talent! Gorgeous card. TFS Happy New Year to you! Just lovely! Enjoying the opportunity to discover so many new blogs, artists and companies. Thanks for being a part of this blog hop! Thanks for the chance to win some really cute products! Adorable card and a sweet prize offer! This has been such an incredible blog hop! Wonderful card! Thanks for being part of this amazing and HUGE hop! Happy 2016! Hi! Great blog! I visited. Very nice. Thank you for the opportunity to win! Happy New Year! Happy New Year! Love your card and the Mini 3D Bow Die Set. Cute design! This blog hop has been so inspirational and giving! Love the bows down the middle! You are so talented! Happy 2016!! This is soooo adorable! Love the bows!!! Wow! H.S and College! That's amazing! I wish you well in 2016! Love the red bows - very striking. Thanks. Just love the bows. So pretty!